Do you have a unique or complicated automation application that you cannot find a cost effective and reliable solution? ASD may already have a solution for you. We have a wide range of product knowledge and can provide the required components and solutions for your application. If not we can always custom design the best solution for you. 22 Years of experience in the Industrial Automation Industry has shown us that in some applications, "off the shelve" products and solutions do not necessarily meet the requirements of a specific project. These products either do not have the necessary functions or they are too complicated to apply or turn out to be too expensive. So where to go from here to find a solution? This is where ASD can step in. Our 22 years of experience enabled us to custom design and build certain types of automation products that are flexible and cost effective enough to apply to many different control applications. 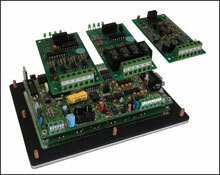 These base products can be modified or re-programmed to solve a wide range of application problems. Since the base design is already available it is not as cumbersome or expensive to create a custom solution for your application as it would be if we were to start from scratch. ASD also has partnered with various manufacturers to bring you the most cost effective and complete solutions for your control application needs. We also build electrical control panels both in-house and as a joint venture with our UL508 certified electrical panel shop partner CSIS. Please click on the above link tabs to learn more about the various products and solutions we can provide.